This inspiring book created just for women offers contemporary prayers that are brief-for today's busy woman-but bold enough to have life-changing impact. With Daily Conversations with God, women will find true refreshment for their spirit and a renewed sense of God's loving presence in everyday life. 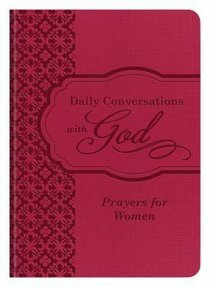 About "Daily Conversations With God: Prayers For Women"
Since the company began as "Book Bargains" in 1981, much has happened to bring this company from a small remainder seller into a prominent Christian publisher. When Hugh Barbour began buying and reselling other publishers' excess stock, he was introducing a new concept to Christian bookstores. Soon, though, the new company began publishing its own titles, beginning with the classic allegory The Pilgrim's Progress in 1984. With a new name, Barbour and Company, publishing operations continued with two books that Hugh Barbour says "really put us on the map "Oswald Chambers' beloved devotional My Utmost for His Highest, and Barbour's first original title, The Bible Promise Book. Each found a ready market and, millions of copies later, remain on Barbour's best-selling backlist. Barbour and Company had found its niche: publishing Christian classics at value prices. - Publisher.